Mitt Romney probably wishes the election were being held today, and Barack Obama that it be held closer to the 15th than next week. My DSL being out for a few days allowed for some breathing room in my battleground average poll tracker which shows demonstrable movement towards Obama between October 27th and 1st of November. If held today, Mitt Romney would lose narrowly. If held on the 15th, Obama might end up winning quite soundly. I track all polls that I find for eight important states: Colorado, Florida, Iowa, Nevada, Ohio, Virginia, New Hampshire, and North Carolina. I take that data and average the most recent five polls from each state and track that by day. With a four day gap in results (but not data, I have all the data), you can clearly see that Obama has increased his lead in Iowa, Nevada, New Hampshire. Obama has increased a razor thin and previously meaningless 0.2 point average lead in Virginia to a very meaningful (this close to election day) 1.4 points. Obama has also gained on Mitt Romney in North Carolina (0.4 points closer and trailing by 2.4) and Florida (0.8 points closer and trailing by 0.4 points.) Obama has held steady at +2.6 points in Ohio since the 26th. Mitt Romney’s only good news is that he’s gained on Obama in Colorado by 0.6 points and is now trailing by 1.6. That’s more like cheer up buddy news than good news. Romney can’t win this election without Florida and Ohio at this point, and while Florida is beginning to slip away into a tie after Romney was leading there by an average of 1.8 points one week ago, he hasn’t made a dent or even put a scratch in Obama’s Ohio advantage. That’s not the whole story, though. Not all polls are of equal value. The most recent poll out of Ohio is from a firm called Wenzel Strategies, on behalf of Citizens United, the group that gave us unlimited corporate spending in elections. That poll is likely worthless as it’s an outlier amongst Ohio polls of the general election matchup, and an outlier in the Senate and Gubernatorial races. Not to mention the facts that it’s a GOP pollster with little to no credibility. Wenzel has only polled Ohio twice this year, both times only when paid by CU. But that’s why we use averages and medians. Obama’s average lead in Ohio is 2.6 points, and his median lead is 3 points. Without Wenzel, the average would be 3.8 points for Obama. So keep in mind the trends, averages, and medians, and beware outliers. There will be a lot of partisan “pollsters” out there looking to rewrite the media narrative in favor of their party over the next week or so with bogus methodology and shady data. The electoral college projections haven’t changed much. Obama continues to gain estimated votes with Nate Silver’s model as his numbers in Iowa, Nevada, New Hampshire, Ohio, and Virginia firm up. 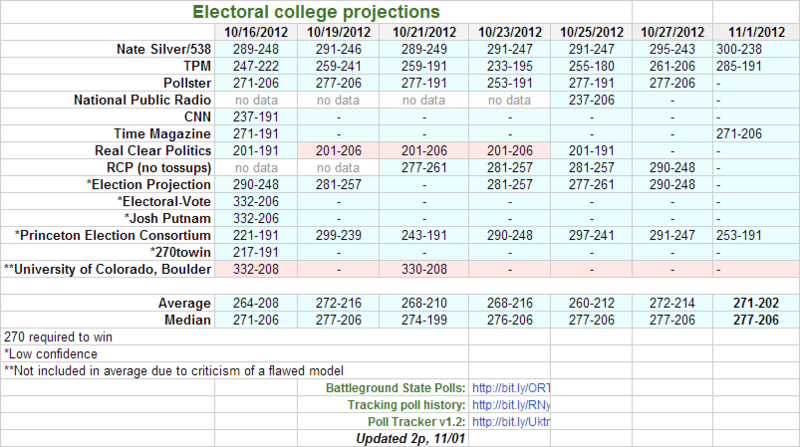 Only three projections changed between October 27th and November 1st, and Obama gained ground in three of them. The average of them all barely changed, with Obama losing one electoral vote to 271, and Romney losing 12 to 202. The median didn’t change at all, still at 277-206, Obama high. The last numbers story I posted had most projections pushed to a 303-235 win for Obama when tossups were eliminated. Most of these sites still have tossups, but I’d note that 538 is moving towards that number, currently at 300-238. I’d guess that’s probably very close to where we’ll end up. Virginia is moving away from tossup to leans Obama while Florida is moving away from leans Romney to tossup. The fact that Mitt Romney needs Florida and Ohio to even have a shot at winning means that with four days left, as I said a few days ago, you can expect almost nothing to change between now and election day when it comes to the final result. As of today, the biggest question isn’t who will win the election, but which of 2-3 states will push Obama over the finish line first and in what combination.